Wouldn't it be fun to be able to turn the reverse camera on at any time? For no *practical* reason of course... but you have to admit it would be fun! Well, it can be done! And it isn't all that hard to accomplish once you know the tricks. 2. Telephone Wire Tap Connectors Radio Shack 64-3081. 3. Small SPST toggle switch. 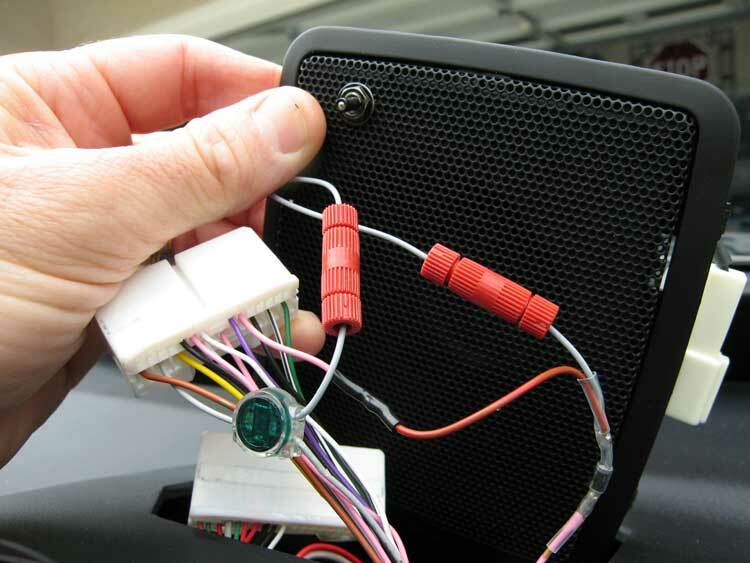 The first step is to pry out the center speaker from the dash. I used a popcicle stick that I sharpened the flat way (like a spatula) with a utility knife. Lift along the edge nearest you first. (ignore the switch for now, as these pictures were taken after I was done with the mod). When the edge nearest you is popped up (you can see the front two clips here, there are also two more clips, one on each side) - just pull the whole speaker out and disconnect the white harness. The edge toward the windshield will come out after the front is up - do NOT try to pry the rear edge out, as those clips are different. Now look through the windshield into the speaker hole with a flashlight, and you'll see the two big white connectors on the back of the MFD. Here is a picture through the windshield, and through the speaker hole - exactly what you'll see. The speaker connector is on the left in the foreground (red and white wires). The connector we want is the larger white one on the driver side shown here (though we'll remove both). The clips that hold the connectors in are on the top center of each connector. 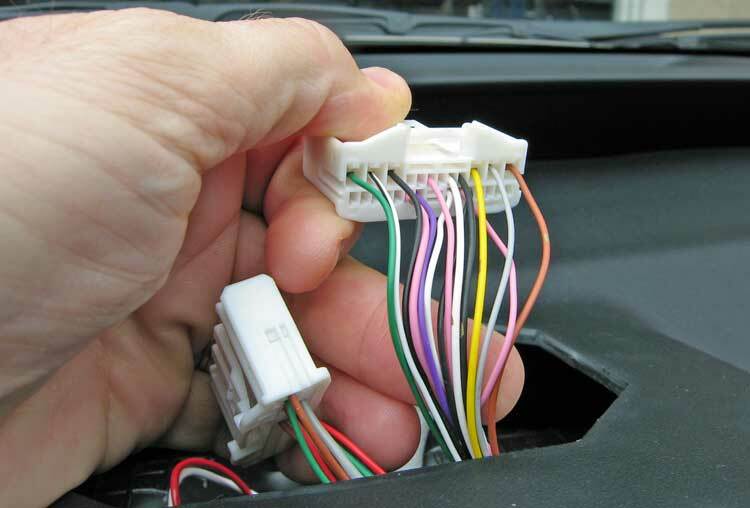 Now get in the car, and blindly reach through the hole to find those clips, and release both white connectors. And once released, you can pull them up through the hole. I found that releasing both of them gave me more slack, and once you get one, the other is no problem. Shown here is the one we'll be using. 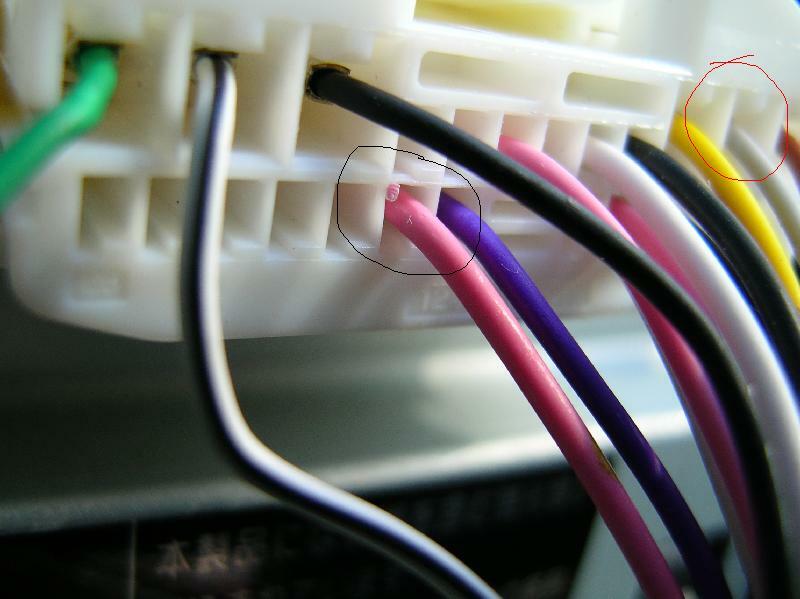 And you can see the gray and pink wire we'll use (circled in the next photo). Here are the wires we'll be jumping together to get the camera to come on. There are lots of pink ones, so make sure you get the one next to the only purple wire. Here are all the connections that need to be made. The goal for the switch (not shown until the next picture) is to selectively jumper the gray wire to the pink wire, and the diode is to keep the reverse lights from turning on. Nothing gets pulled to ground, we're just passing the + signal of the gray wire over to the pink wire to activate the camera and screen. The pink wire is cut, and a diode is installed inline (note: this can be any 1N400X series diode, like 1N4001, 1N4002, etc from Radio Shack). 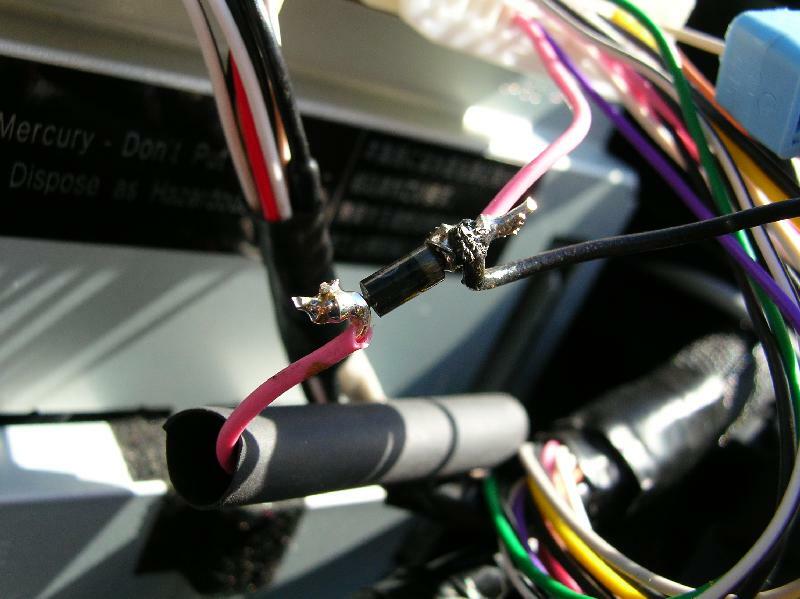 The banded end of the diode is connected back to the pink wire coming from the connector (shown here using a red wire going through the red barrel connector) AND jumped over to the gray wire. I used a telephone "vampire" that works great on this gage of wire. The switch will eventually go on the added length of gray wire shown here. I decided to mount the toggle switch in the speaker grill, instead of drilling into the dash somewhere. No long wire runs, and nothing expensive gets ruined. Here I snipped the gray wire, and wired the switch in (with barrel connectors so it is easy to again remove the speaker without cutting wires). 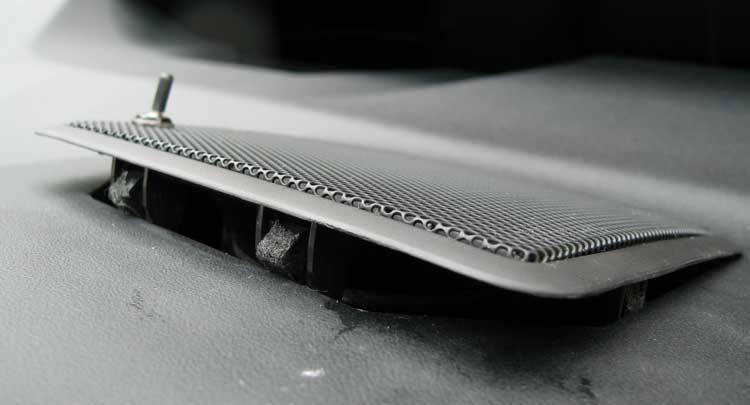 When mounting the switch in the grille, note the angled shape of the speaker hole, and be sure the mount the switch so that it will pass easily into the speaker hole. Snap the connectors into the back of the MFD (you do remember which one goes where, right?). Clip side up, remember! Pop the speaker back in (some prefer the stereo sound without the middle speaker, so you may want to try leaving the speaker harness off at this point). And you're All done. The only outward sign that I've changed anything is this tiny toggle switch. I painted the chrome parts of the switch black, and added black shrink tube to the baton to make it even more unobtrusive. And finally, the proof that it actually works. Notice the trans is in P, and I'm seeing down my driveway to my neighbor's house across the street on the MFD. Success! 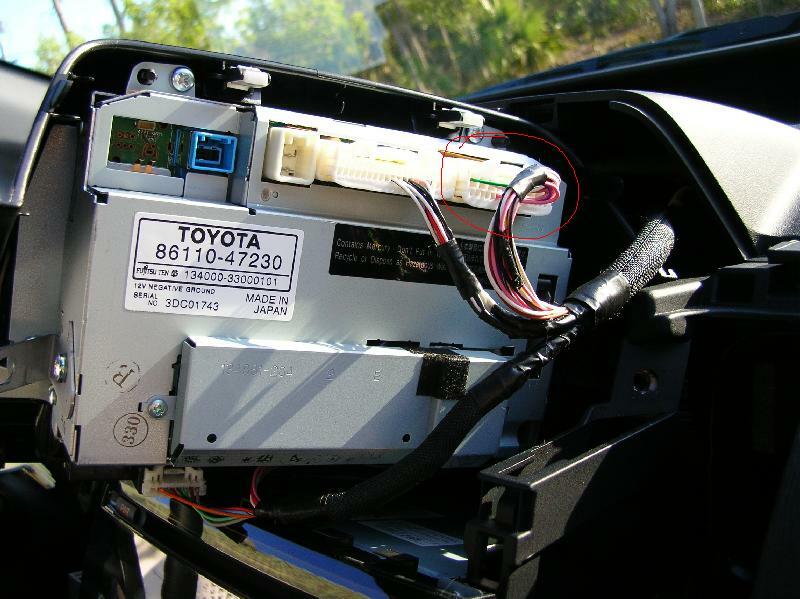 1) Install a pushbutton switch in the dash, ala Evan Fusco's directions for installing the EV switch, using one of the blank plates in the dash: link A toggle switch might be more appropriate - especially if you are going to use the display for video input (DVD). Follow his steps carefully up to his page 7. 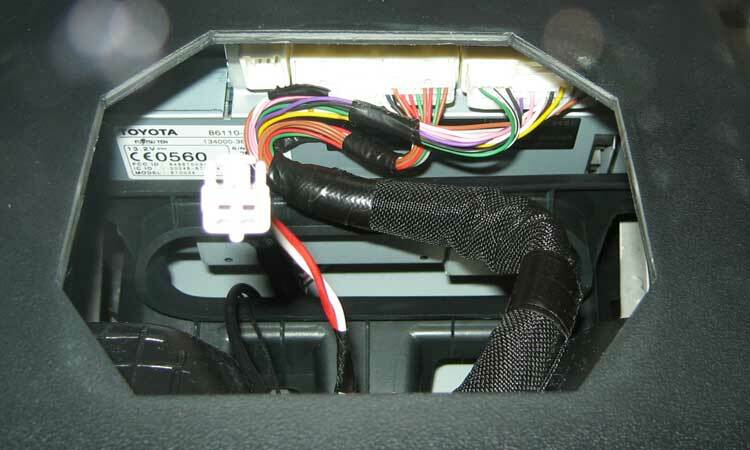 You don't need access to the stereo so you don't need to remove the compartment below the radio, or the radio itself. Once you have removed the MFD, skip from page 7 to page 9 to reinstall the panels in the proper order. The gray wire, pin #2, circled in red, is the +12 volt power to the MFD, which we need to "vampire-clamp" to send power to the switch. 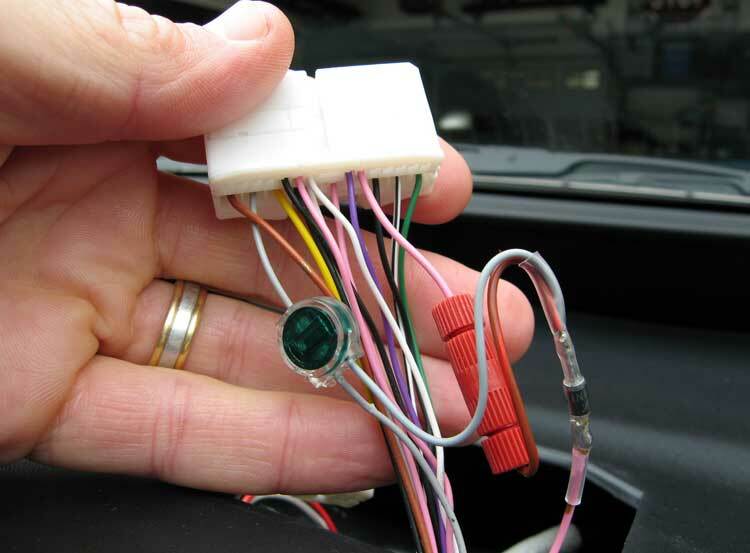 The pink wire, pin #21, circled in black, is the reverse trigger wire from the backup lights to the MFD. 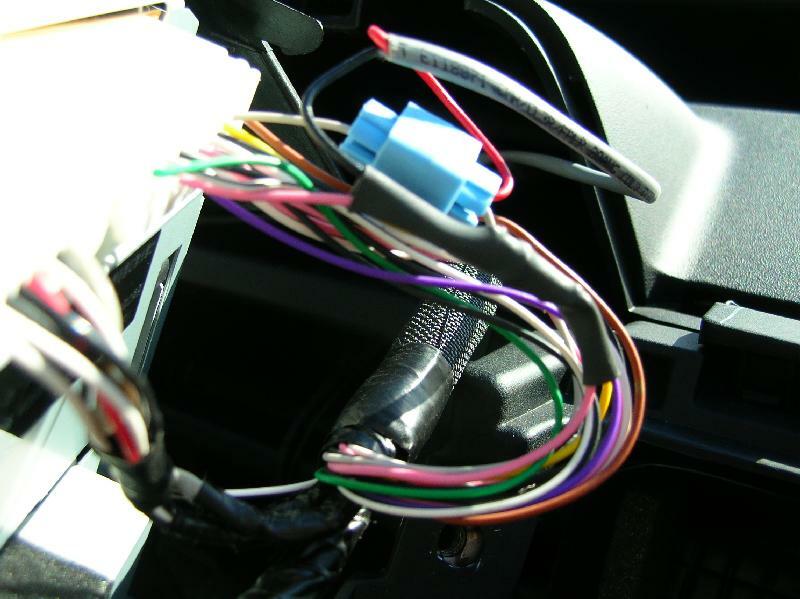 According to my schematic, on a NAV-equipped car this is a red wire. This wire needs to be cut, and a diode installed into it with the banded end toward the MFD, to keep our new switch from turning on the backup lights. Remove the electrical tape wrapped around the bundle to give you more wire to work with, and cut the pink wire. 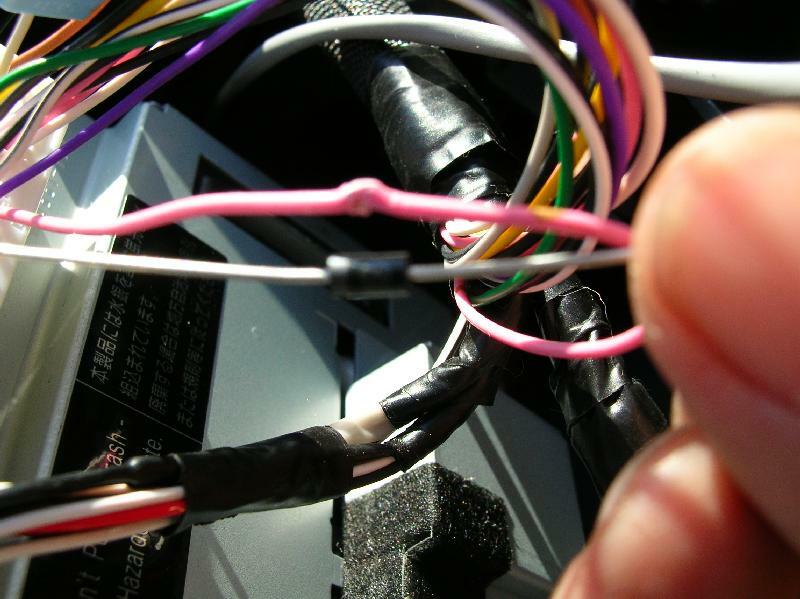 Slip a piece of heat shrink onto the pink wire before soldering. 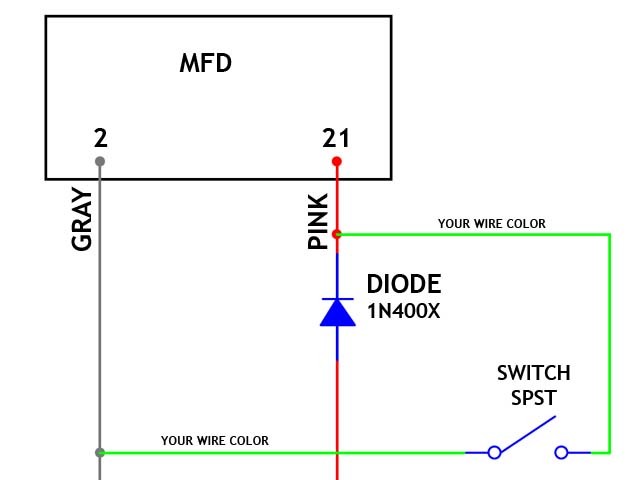 Also, you will want to solder one of the wires from your switch to the banded end of the diode, the end connected to the MFD connector. Use a heat gun to shrink the heat shrink onto the diode. 6) Follow the directions on the last page of Chris Dragon's stereo instructions to reassemble your dash. That's it! You can now push the button any time you want to see the rear camera. However, as someone pointed out, it is an EXTREMELY wide angle, like a fisheye lens, so anything more than 50-100 feet behind you is invisible. The wire is coaxial, which means that there is an insulated conductor in the center, surrounded by a copper braided outer shield. The red center conductor is the (+), and the outer shield is the (-). Toyota took some of the outer copper braided shield, pulled it together and twisted it into something that looks like a bare stranded wire, tinned it with solder, and then wrapped it in shrinktube to keep it from shorting out to anything else. You need to cut off a little bit of that shrinkwrap, to access the (-) shield, to tie the (-) conductors from the DVD or other video source to it. The camera, MFD, and DVD jack all share a common (-) video ground input. OK? You can't just vampire clamp the (+) wires together, as you would have BOTH the camera AND the DVD video at the same time, NOT pretty! First, as I said above, you need to tie all the (-) leads together, but not cut or break them, just bind them together into a common video ground. But, here's the tough part, which I didn't take pictures of because I didn't have my camera at work when I did it: the red wire is the video (+) coming in FROM the backup camera. What we need to do is interrupt that video, and replace it with whatever it is we want to display. So, to do this, you need 2 coaxial audio/video cables, as I described above. I just used an old audio patch cord I had laying around, from an old cassette deck, and cut the plugs off of it. You tie the braided copper shields both together with the shield you revealed when you cut into the shrink wrap. I soldered them, to make a really good connection, but you may be able to improvise with those vampire clamps. The important thing is that all 3 shields are tied together in common. Now, the red wire: you need to cut it, and solder the center conductor (+) wire from one of the audio/video cables to the end of the red wire coming FROM the camera, and solder the other center conductor (+) wire to the other end of the red wire, the piece still connected to the back of the MFD. So, now you have 2 coaxial A/V cables, routing the video signal from the camera down to wherever you are going to mount the video jack. One has the video (+) on it from the camera, and the other will take video back up to the MFD, OK? 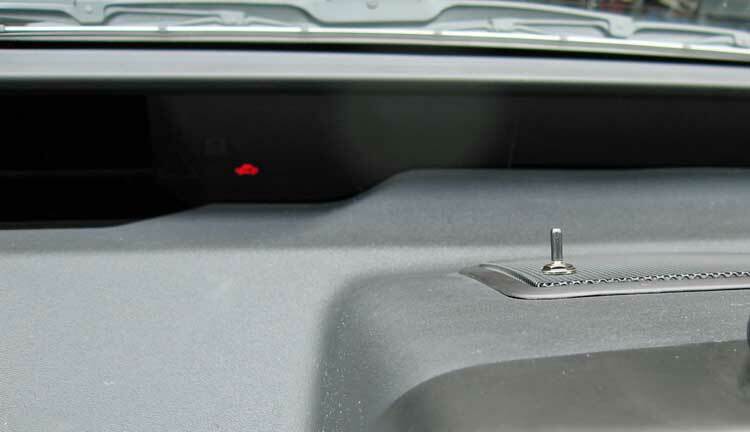 Here's the tricky part: you need to use a type of jack that will automatically switch OFF the backup camera video whenever a plug is inserted into it. You could use a standard RCA phono plug, like a DVD player's composite video is already using, but I couldn't find an RCA phono jack locally that had the switch built into it. So, instead, I used a 1/4" phone plug, like the old-style headphones used, except it is only a 2-conductor, not a 3-conductor stereo plug, Then, I bought an adapter to go from the DVD player's RCA phone plug on the end of the cable to a 1/4" phone plug. Then, one needs to look VERY CLOSELY at the 3 terminal connections on the 1/4" phone jack like I used. On of the solder lugs is connected to the outer ground ring of the jack, the metal parts that include the nut and threaded area. That's ALL the common ground, which you need to solder BOTH coaxial shields to. That takes care of the (-) ground part of the video. But, for the (+) part to switch properly, look at the 2 remaining solder lugs on the jack. If you look at it carefully, and study the construction of the jack, you will see that one lug is connected to the prong on the jack that will touch the tip of a 1/4" plug when inserted, so you know that has to be the (+) video output that needs to go to the input of the MFD. So, when you plug a video source into the jack, the (-) part of the video signal comes in on the outer ground ring around the jack, and goes up the coaxial shields to the MFD, whereas the (+) video signal comes in on the tip of the plug, touches the prong on the jack, and takes it up the A/V cable that is connected to the red wire coming out of the MFD. Then, you only have one terminal left, which is the connection that gets OPENED whenever a plug is plugged into the jack, which is where we want our camera video (+) to come into, so solder the remaining coaxial center conductor to that terminal.